Christmas party in Orange Country is right around the corner ... all the details of this event is in the image below!!!! Hope to see you all there. Read our Newsletter "Al Nejmeh"
Welcome the first edition of the Bethlehem Newsletter "Al Nejmeh." The Bethlehem Association encourages all members to submit articles and local community news. Please email us at bethlehemassoc@gmail.com. Click here to view the entire newsletter online. 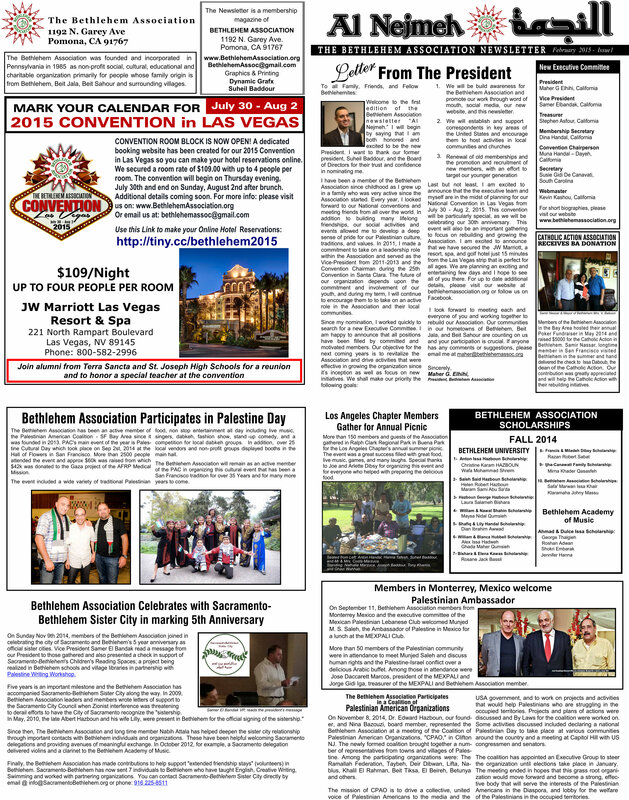 Read more about Read our Newsletter "Al Nejmeh"
Southern California Members and Non-members, come join us for our Annual Summer Picnic! Please also join our Facebook Page https://www.facebook.com/TheBethlehemAssociation, to get the latest news. 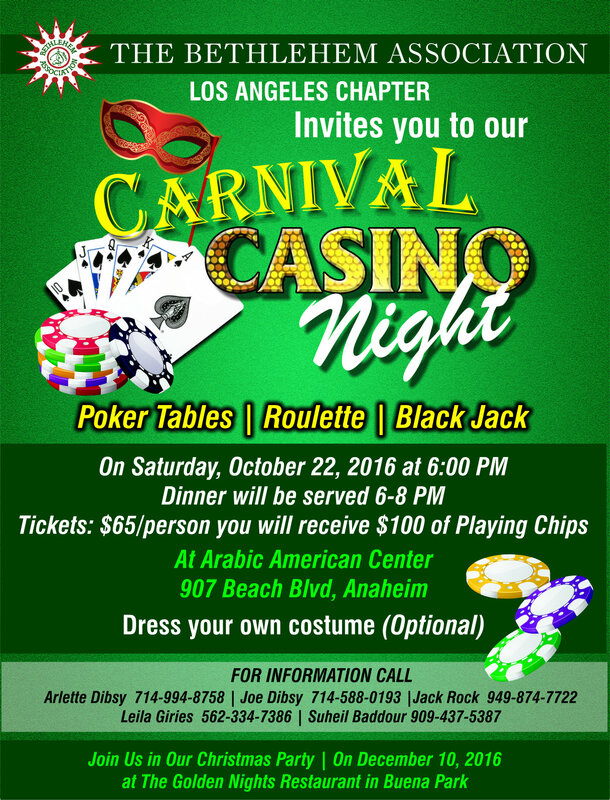 The Bethlehem Association would like to thank all the players again who joined us in the Bay Area for the Annual Poker Fundraiser. The $5000 raised was delivered by our member, Samir Nassar to the Catholic Action Association in Bethlehem. Our contribution was greatly appreciated and will help the Catholic Action with their rebuilding initiatives. The Bethlehem Association would like to thank all the players who joined us in the Bay Area for the Annual Poker Fundraiser. The event was a great success and the local chapter raised over $5000 in donations. Congratulations to our top 3 players Samir Nassar, Jeff Pollack, and Suheil Saliba. The Bethlehem Association would like to thank Blue Dog Events and Sam Salem for hosting our tournament. Thank you for making the event fun, easy, and profitable. Los Angeles Chapter held their summer picnic at Irvine National Park on July 28, 2013. All had a great time, enoyed the beautiful and large park. All had fun in chating bringing back old mermories, played backgammon, others enjoyed the Hookah. Few quets honred us with their presence, Mr & Mrs. Samir Khoury of Birzeit Society, we were also honored by Mr. Alex Eid and his family from Haifa who fried fresh fish at the park. Los Angeles Chapter will organize another picnic event in September. Thanks to all who were with us in this event, looking forward to see you all in our next events.